Estonians are proud of their traditional dishes – the rye bread, potato salad, selection of meats, sausages, marinated fish, pickles. One dish which was historically never missing from a party table, is rosolje – a beetroot and potato salad. And wherever Estonians emigrated, they took the tradition of making rosolje with them. 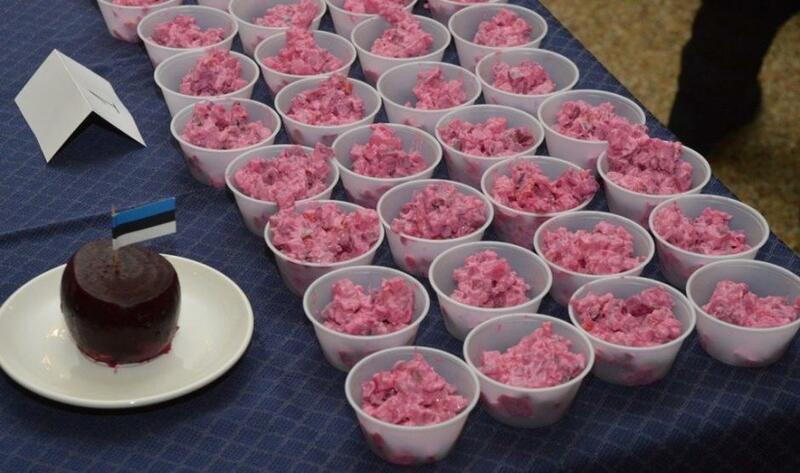 So it is fitting that the New York Estonian House chose this dish for their food competition. Food competitions organised by Liisi Vanaselja, one of the organisers at the New York’s Estonian House, have become a small tradition there – the competition got started two years ago with the small pies contest, Estonian potato salad was in competition last year and this year’s event was to see who had the best secret recipe for rosolje. The main components of rosolje are boiled beets and potatoes, combined with onions, peas, pickles, boiled eggs and, according to taste, pickled herring, boiled or smoked meat, or smoked sausage. The sauces used are mayonnaise and sour cream, which is seasoned with salt and pepper. Rosolje can be made without fish or meat, but as always, that would raise a dispute as to whether it is rosolje or just beet salad. Everyone who is accustomed from childhood to have herring in rosolje will not allow any other version to be called that. The heyday for rosolje was between the 1930ies and 1960ies – no party in Estonia was held without it. Gradually, however, the uncrowned king of the party table was pushed out by the potato salad, which had simpler ingredients and was easier to make. However, rosolje does appear more often than the potato salad on the party table of the people who have emigrated from Estonia. This year, seven different recipes were presented, and each one had to be evaluated on a five-point scale. The salad was divided into numbered cups. The version that tasted great got five points and the one not so much was given fewer points. 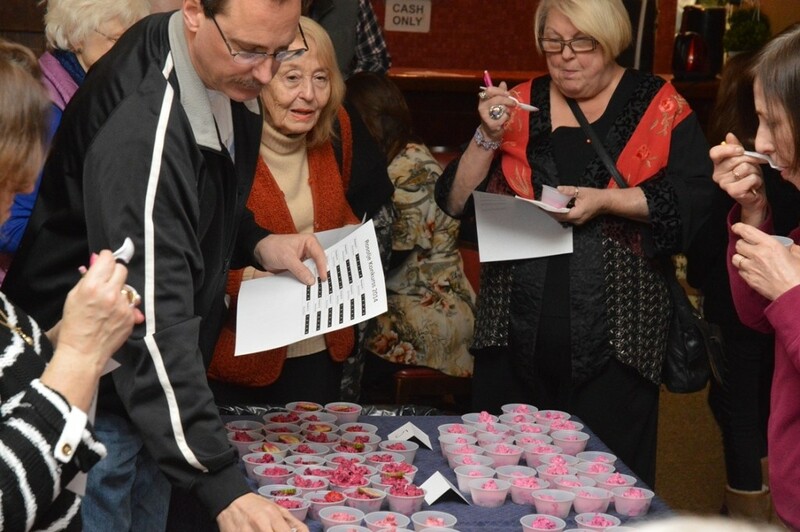 Scorecards and pencils were distributed and the contest began. Of course, every food is a matter of taste, and as long as the filled cups remained on the table, the discussion continued as to which bite tasted the best. It was a good thing that this time there were only seven rosolje makers – everyone got quite full from all the tastings and more would not have fit. This year’s winning recipe belonged to Rita Illison whose rosolje was prepared by her friend Kadri Kroon. Illison is one of those Estonian-Americans with a rollercoaster life story. Born into an Estonian emigrant family who had fled the Soviet occupation, she graduated from Toronto’s York University with an economics degree and then moved to New York City. Later on, she moved to Sweden where she married a Finn. When Estonia regained its independence, Illison moved back to the country of her ancestors and in 1993 she was named the chairman of the Estonian Accounting Standards Board. Under her leadership, the Estonian Accounting Act was established. This year, she’s turning 60, on Estonia’s Independence Day. One thing was not lost during her busy life and was closely guarded – her family’s old rosolje recipe. “Rita usually makes this rosolje recipe at her family’s special gatherings, but I actually came upon this recipe when she posted it on the Estonian Cooking Facebook page – and since the recipe was so interesting, I asked Rita if she would like to participate in our rosolje contest where I would make the salad under her name. And so it happened that her recipe won. Rita will be in New York for her birthday and I will present the prize to her in person,” Kadri Kroon explained. Four small onions; five finely diced cloves of garlic; 10 finely diced pickles; 10 medium-sized new potatoes, cut lengthwise into wedges and sliced into cubes. Boil the cubed potatoes and rinse once to stop the cooking process. Honey dijon mustard to taste (otherwise use 2-3 tbsp honey and the same amount of mustard). Add 300 ml mayonnaise and 250 ml sour cream and pour over with some of the pickle and beet pickling liquid. Stir gently. Three apples (tart/sour like Granny Smiths); 600-700 grams diced smoked ham (remove all fat and rind) ; four cubed marinated herring fillets. Do not use marinated herring from a jar – it turns into mush. Marinate the fillets in onion, garlic, dill, parsley, cloves, salt, pepper, a dash of brown sugar and wine vinegar. 1200 g diced pickled beetroots; a fistfull of dill. Use scissors to snip the juice of two lemons. Gently stir. You want it to be pink, sweet/sour/salty and not too dry or wet. You will probably need to add about 200 ml mayonnaise and 150 ml sour cream to make it bind properly. Stir gently and season with salt and pepper. If it is not pickled enough, add more pickling liquid, lemon or wine vinegar. Wait for an hour before taking any additional measures. Once you have tasted a good rendition you will have to improvise with the seasoning to get it just right. Siiri Lind is a New York-based photographer and blogger.